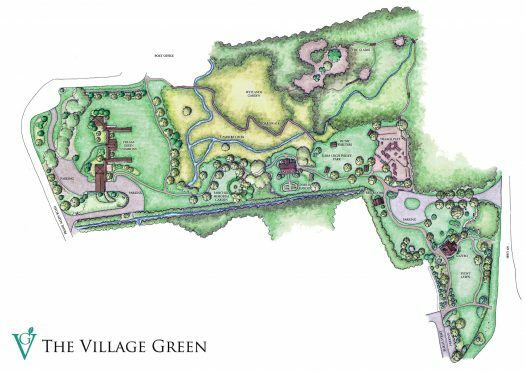 Hosting thousands of visitors and over 80 events each year, The Village Green is not only the heart of Cashiers in its location, but also in its ability to draw family and friends together in community. It is a special place where people and nature come together. Stroll the paths of the park around grassy lawns, along wetlands and through the forest glade. Enjoy a picnic lunch with friends. Learn about raptors, honeybees, native plants and bears. Celebrate the seasons and capture treasured moments with family. Discover art, culture and regional heritage. Host a party, wedding or reunion. Photograph colorful dahlias. Listen to a concert. Dance beneath the stars. In April 1992, with the vision of one and the hard work of many, the center of Cashiers was saved from becoming the site of a hotel chain. Three area residents purchased the property and donated it to a charitable 501c3 organization to preserve the land for the community. The Village Green was established with the mission to preserve and enhance the land for civic, spiritual, academic, recreational and cultural activities. From the beginning, The Village Green was designed to be a park for the people. The founders set out to create a free, public space that would maintain the mountain lifestyle unique to Cashiers. 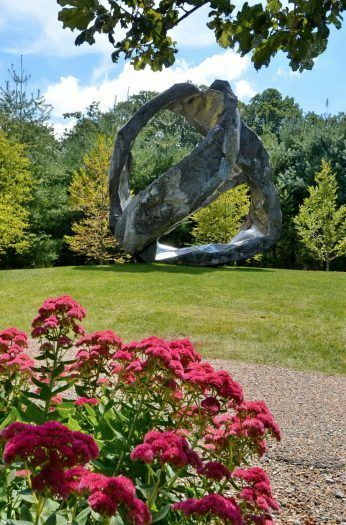 Since that original acquisition, The Village Green has grown to encompass meandering walking paths, rustic pavilions, exceptional sculpture, beautiful gardens and a large children’s playground. The Village Green is enjoyed by thousands of visitors and home to many large community events every year. We hope you enjoy your time in the green heart of Cashiers! The Gazebo and Event Lawn are at the crossroads entrance of The Village Green on Highway 64. The Gazebo is a mountain rustic structure that may be used for various events. The large pavilion located in the center of the park is a rustic structure with picnic tables and a charcoal grill. This area is suitable for picnics, birthday parties, family reunions and other gatherings. The Village Green Commons is an open air, multi-use venue featuring a mountain rustic pavilion structure and sprawling meadow lawn. The site of large private occasions and community events. ADMISSION: No charge. Donations are appreciated. HOURS OF OPERATION: Open 8 a.m. to dusk, 365 days a year. The Village Green is home to eight sculptures. The sculpture collection brings together varied medium and styles. Utlunta (cover photo) is a popular subject for photos as well as climbing. Juicy Fruit is a colorful as well as playful piece near the playground, and the wind sculpture pieces are enchanting to watch in the breeze. Visit the website for a full list of sculptures. In 2002 the children of Cashiers designed the playground known as the Village Play. It was then constructed entirely by members of the community. 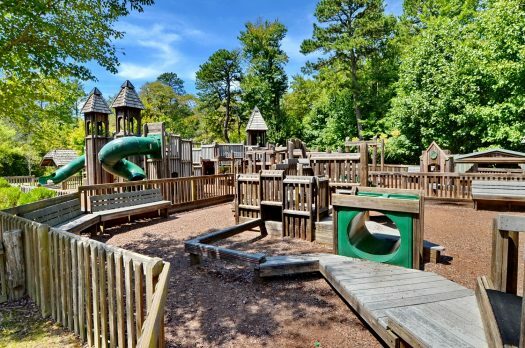 One of the highlights of a visit to the Village Green is this expansive play space with swings and slides; planks and climbing structures; and a puppet theater and playhouse to encourage imaginative as well as energetic play! The Village Green has many garden areas in the park. The Hayes Fairchild Memorial Garden features stone bench seating under a vine covered arbor and enclosed with colorful annual and perennial plants. The Dahlia Garden is a nationally recognized trial garden for a wide variety of the popular tubers that bloom in late summer. Other benches are tucked into the hedges of rhododendron and other native plants. Because the Village Green is the centerpiece of Cashiers, the park is home to many popular community events. Groovin’ On the Green is the free, Friday night summer concert series. Fireworks Extravaganza On the Green is a patriotic celebration July 4th. Leaf Festival is an annual three-day juried arts and crafts show. The Village Green is also the site of holiday observances including the Easter Sunrise Service and Cashiers Christmas Tree Lighting. The Village Green hosts a series of programs highlighting natural and cultural elements unique to this area during the months of May through September. Village Nature Series has featured subjects such as raptor and wolf conservation, wildcrafting and foraging, edible insects, bear preservation and beekeeping, to name a few. These programs are sponsored in collaboration with the Highlands-Cashiers Land Trust. The wetlands is a conservancy project of The Village Green. 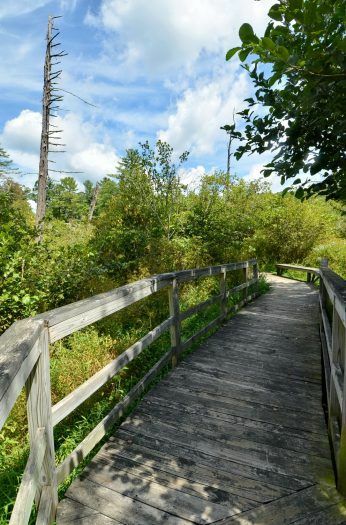 When you step on the boardwalk trail that also leads into a woodland glad, you can see a variety of native plant and animal life. Frogs, dragonflies and a variety of water fowl can be spotted here from time to time. Two varieties of native azaleas, Flame and Pinkshell bloom in the Spring. Throughout the season you will find other interesting plants unique to this area.